For the past year, I have been working for Big Hops, an awesome company here in San Antonio who is all about promoting the best in local and national craft beer that is available for us to sell. We have some of the best customers. From time to time, our wonderful customers decide to do bottle shares at either one of our locations in town, and they bring in some good stuff that they get from their travels or from beer trades. I have had the privilege of tasting some amazing beers from around the world cause of these guests! This beer can was no exception to this. In fact, this can was actually left at the bar for me to have. Awesome guests, I tell ya! Just awesome! I brought the can home, and poured the beer into a Branchline Brewing Company can-shaped glass. 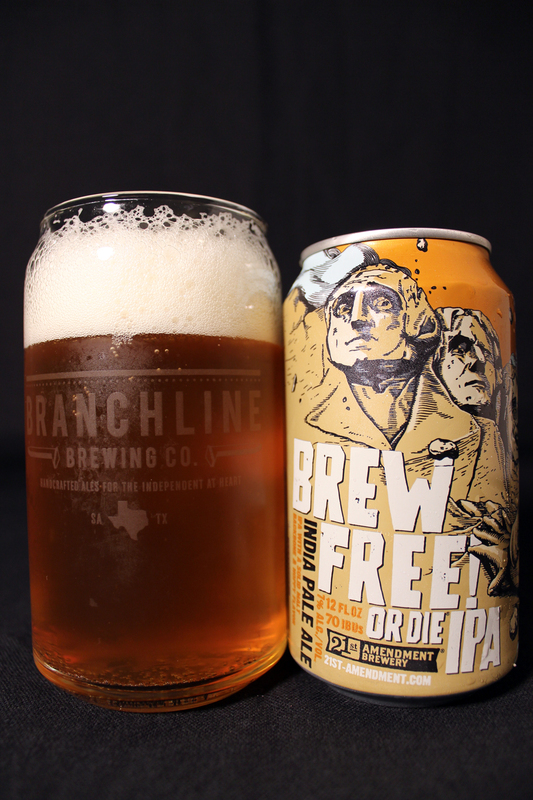 Brew Free or Die IPA’s appearance was a nice clear light golden color topped with a large 2.5 inch white frothy head. Great head retention as it dwindled down to a thin layer atop the beer, leaving a fantastic web-like lacing down the glass. The aroma is full of hops, hops, hops! The bulk of the aroma is floral, piney, grassy, citrus-like, grapefruit and a small amount of a resinous character. There is a nice aroma of caramel malt, and a brown sugar sweetness. Very good balance, here. Grapefruit is abundant on the palate. Other citrus characters are present like orange, and lemon. Again there is a good balance of hops and malts all including floral, grassy, pine, and resin hop presence along with a sweet caramel and brown sugar backbone. The aftertaste is all citrus. Very good west coast style IPA. The body is light-medium, good bitterness, moderately high carbonation. The mouthfeel is crisp and abrasive with a harsh, dry finish. I was very pleased to have tried this beer, but sad that the experience is over with just this one can. Hopefully I can get more of this beer with a few good trades. I am a big fan of the west coast type IPA as they are usually of the citrus flavored nature. Bright and crisp, full of hoppy goodness! This beer is a fine example. I, once again, want to say thanks to my customers at Big Hops who bring in some new and exciting beers for me to try! 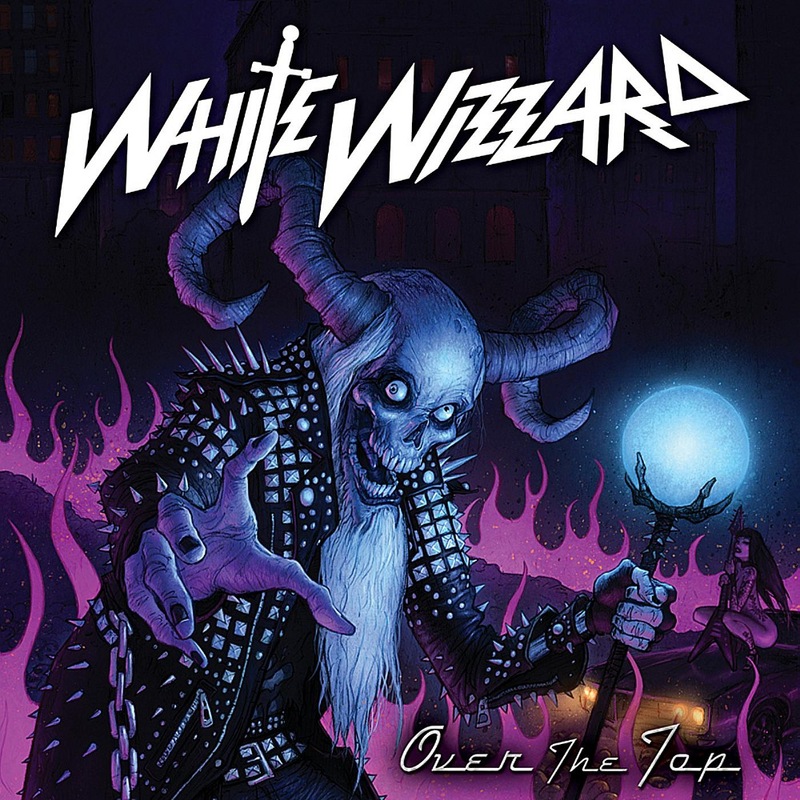 Metal Connection: Live Free or Die by White Wizzard is a perfect song title to pair along side this beer. What makes this pairing even better is that the song is a classic sounding Heavy Metal tune which I consider to be great beer drinking music! Reading the bio of this band is like reading stereo instructions. They formed in 2007, and have had a number of line-up changes with only the original bassist, now vocalist being the only constant member since the band’s inception. This is actually my first encounter with the retro Heavy Metal band from Los Angeles, CA. I am happy to have stumbled upon this band, as I really enjoy this tune, along with other songs from their debut full length album, Over the Top, released in 2010 on Earache Records.